Higher density suburbs that included townhouses and small lot houses first appeared in North America in the 1960s and 1970s when population growth and new household formation caused metropolitan regions to spread over a larger radius, taxing highway infrastructure and lengthening job commute times. Many residents were not satisfied with the design and land use planning of these new, denser developments. Today, a growing population, highway congestion, and higher energy costs make living closer to job centers more desirable. Well-designed compact neighborhoods offered by New Urbanist architects and planners promise quality of life benefits in lieu of the space around the house that once characterized the suburbs. New transit-oriented developments (TODs) are prototypes for smart growth and the creation of badly needed increases in housing stock that are linked to transit in job-rich metropolitan regions. Calthorpe Associates’ award-winning Mountain View, California neighborhood—The Crossings—shows how design excellence can provide resident satisfaction with higher density suburban living. 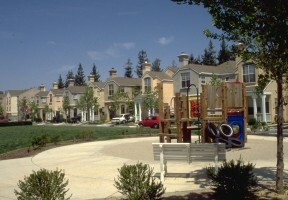 The 18-acre Crossings is an infill project that was built on the site of a failing shopping mall. 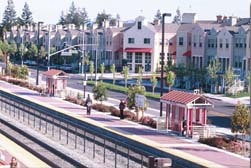 Caltrain, the high-speed rail line that connects Silicon Valley cities with San Francisco, runs along the northeastern boundary of the neighborhood. Ground floor retail, with row house units above, faces a plaza that is adjacent to a new station stop. 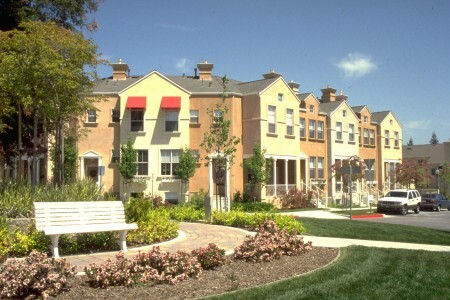 Condominiums are on a podium building that includes parking for Caltrain commuters. 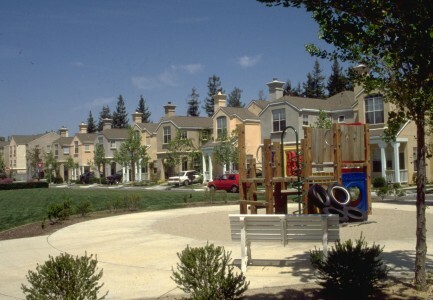 The Crossings includes 102 small lot houses, 129 townhouses, 128 condominiums; a one-acre park with a community center and pool, two smaller parks and greenways. Tree-lined streets, pedestrian paths, and bikeways connect the neighborhood and link it to the train plaza, a nearby school and a shopping center on the edges of the development. Calthorpe Associates planned and designed all attributes of this TOD, including architectural design, site layout, street improvements and landscape features. 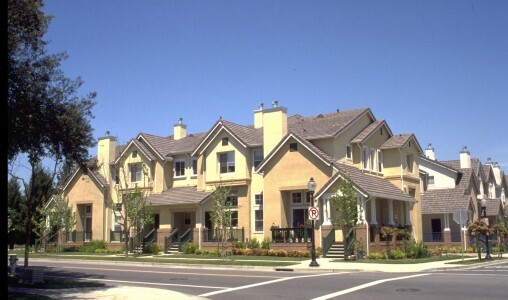 The Crossings’ average density is 30 units per net acre, compared to 7 to 10 units per net acre in the rest of the city of Mountain View. 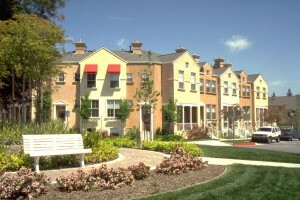 Condominiums and townhouses contribute to the density necessary for cost-effective public transit. By putting more houses on less land, they spare agriculture land from development. They accommodate diverse income, lifestyle and life stage groups. There is a sharp rise in demand for centrally located condominiums and townhouses because of aging baby boomers and an increase in younger households who prefer living in proximity to stores, cafes, gyms and other activity centers. A well-designed and well-located new supply is needed because such homes amount to less than 10 percent of available housing stock. Neighborhoods with houses on less land and are closer to job centers give home seekers alternatives to auto-dependent suburbs dominated by large lot detached houses and this increases demand. Design innovators such as Calthorpe Associates have shown that they can satisfy homeowners; large-scale builders are responding. The Crossing illustrates many of the Environmental Protection Agency’s Smart Growth Principles. 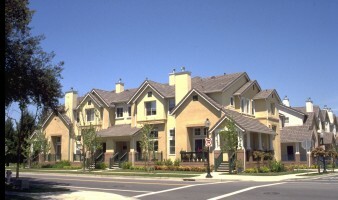 These include mixed land uses, compact building design, a range of housing choices, walkable neighborhoods, a distinctive and attractive place, preservation of open space and farmland, development directed toward existing communities, variety of transportation choices, and community and stakeholder participation. Author: Dr. Linda L. Day is emeritus professor of city and regional planning at California Polytechnic State University and contributing faculty of the public policy and administration program of Walden University. Day is the author of This House is Just Right: A Design Guide to Choosing a Home and Neighborhood. She blogs for Planetizen.com. Follow Day on Twitter @LindaLouiseDay1.